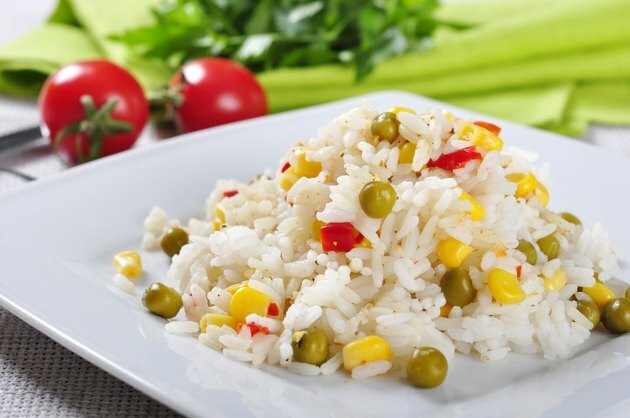 Twenty percent of the daily calories consumed around the world come from rice, according to the Food and Agriculture Organization of the United Nations. Steaming rice is one of the healthier ways to cook this food because this prevents the loss of water-soluble nutrients into the cooking water and doesn't require any added fat. Steamed rice is a healthier alternative to fried rice, especially if you choose steamed brown rice instead of white. A 1-cup serving of cooked medium-grain brown rice has about 218 calories, 1.6 grams of fat, 4.5 grams of protein and 45.8 grams of carbohydrates, including 3.5 grams of fiber, or 14 percent of the daily value. Choose medium-grain white rice, and each cup has 242 calories, 0.4 gram of fat, 4.4 grams of protein and 53.2 grams of carbohydrates, including just 0.6 of a gram of fiber. Getting the recommended amount of fiber in your diet may help lower your risk for heart disease, high cholesterol, type-2 diabetes, constipation, obesity and certain types of cancer. Fiber helps fill you up without a lot of calories, making high-fiber foods good choices for those on a weight-loss diet. Each serving of brown rice provides 13 percent of the DV for thiamine and niacin, 15 percent of the DV for vitamin B-6 and phosphorus, 21 percent of the DV for magnesium and 107 percent of the DV for manganese. White rice is often fortified, so it contains more folate, niacin, iron and selenium than brown rice, but otherwise contains less of most essential vitamins and minerals. The B vitamins folate, thiamine, niacin and vitamin B-6 help you turn the food you eat into energy, and phosphorus and magnesium are important for forming DNA. Manganese and selenium both act as antioxidants and help limit damage to your cells from compounds called free radicals. If you're on a weight-loss diet or have diabetes, there's another good reason to choose steamed brown rice over white. Brown rice usually has a lower glycemic index, which means it doesn't cause your blood sugar to rise as much as white rice, according to a study published in the "International Journal of Food Sciences and Nutrition" in 2006. A diet that is lower on the glycemic index is also more filling than one that that contains more high-glycemic-index foods, notes an article published in "Nutricion Hospitalaria" in 2005, potentially making it easier for you to eat less and lose weight. Don't make rice your main grain, however, as it often contains some level of contamination with the heavy metal arsenic, which can increase your risk for cancer and other health problems. A September 2013 article published in "Consumer Reports" recommends that adults limit their rice consumption to no more than two 3/4-cup servings per week.